I love my iPhone and am unapologetic about it. I have friends who say they would never pay the monthly bills that come with. I say screw it. I get headlines, baseball scores, Facebook, Twitter, music… well, pretty much anything I want whenever I want it. What I don’t have is a really good camera – at least not on the iPhone I have. But that’s cool because there are so many apps that let you play with your photos that I can do without the great camera. By far my favorite is the Tilt Shift Generator by Art and Mobile. It costs a buck and I got my money’s worth in about 6 seconds. It allows you to create these kind of retro miniature photos – an effect I just love. You can also control saturation, contrast blur and vignetting. The photo above was taken last week at a Phillies game. Phils won 10-7 after kicking away a seven run lead. 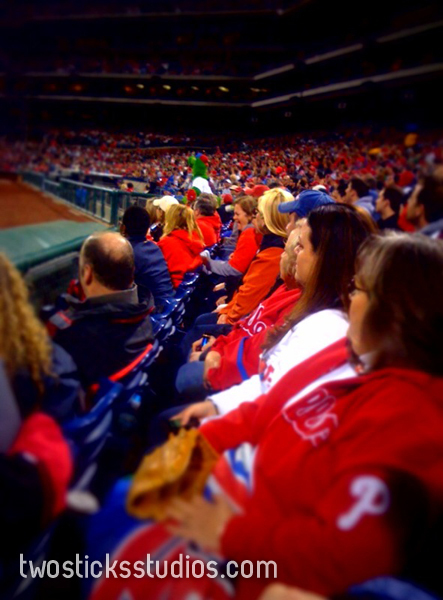 By the way, if there’s a better entertainer than the Phanatic I’ve never seen him.